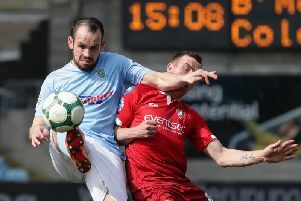 Ballymena United’s Johnny McMurray sealed the three points for the Sky Blues after his 91st minute winner saw off Glentoran 3-2 at the Oval. It had looked so good for Glentoran as they had led 2-0 at the break but three second half goals from United sealed the win for David Jeffrey’s side. And McMurray - who was returning after injury - got the vital late. late winner. It was 1-0 to Glentoran in the 10th minute as Chris Lavery’s cross from the left was deflected into his own goal by Ballymena defender Adam McCracken. The defender was unlucky as he was just in the wrong place at the wrong time. The Glens has another chance in the 23rd minute but Curtis Allen dragged his shot wide of the target. United had a chance to grab one back in the 21st minute but Cathair Friel missed the target after latching onto a Glendinning punt. It could have been 3-0 ten minutes before the break. A Ross Redman cross found Allen but his shot was well saved by Glendinning. It was 2-1 in the 50th minute as Cathair Friel went on a 40 yard run before feeding the ball through to Fra McCaffery and he fired home past Eliott Morris. It was a good finish from the former Glens midfielder and it was his third goal in two matches. The Glens McAlorum nearly grabbed his side’s third in the 64th minute as his shot from the edge of the box beat Glendinning but not the post. United’s Friel tried his luck with a volley in the 80th minute but his effort flew over the bar. It was 2-2 in the 85th minute as Johnny McMurray’s cross was headed across goal by Willie Faulkner before it fell to Tony Kane and he fired home from close range. Then United got the winner through McMurray in the 91st minute as the striker rifled home after being put through at the very death. Glentoran: Elliott Morris, Jay Magee, Curtis Allen, Chris Lavery, Eric Foley (Stephen O’Flynn 88mins), Aaron Harmon, Stephen McAlorum, Jonathan Addis, Ross Redman, James Ferrin, Jonathan Smith (Kym Nelson 69 mins). Subs: Dwayne Nelson, Nacho Novo, Tiaran McAuley. Ballymena United: Ross Glendinning, Tony Kane, Kyle Owens, Gavin Taggart (Johnny McMurray 69 mins), Allan Jenkins, Willie Faulkner, Cathair Friel, Ervin, Leroy Millar, Fra McCaffery, Adam McCracken. Subs: Darren Henderson, Danny Wallace, Alan Blayney, Caolan Loughran.